Come Celebrate Second Annual Akio Suyematsu Day! Please join the Suyematsu & Bentryn Family Farmers Guild, The Suyematsu Family, EduCulture and others in remembering this locally grown hero. All are welcome to attend. 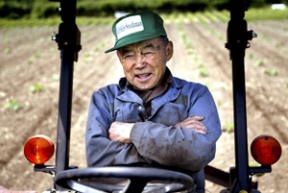 Following his passing in 2012, the City of Bainbridge Island proclaimed August 19 “Akio Suyematsu Day” in honor of this iconic farmer. Akio Suyematsu was the last of the original Japanese American Bainbridge Island berry farmers, who created an agricultural and community legacy on a working landscape second to none in the Puget Sound region. His life’s work has kept alive a taste of Bainbridge for over nine decades and inspired generations of local farmers. This celebration will feature a memorial display of Akio Suyematsu’s life, an historic walking tour of the farm, live music, and locally grown food and refreshments. This entry was posted in Events, Only What We Can Carry by gmacd_admin. Bookmark the permalink.